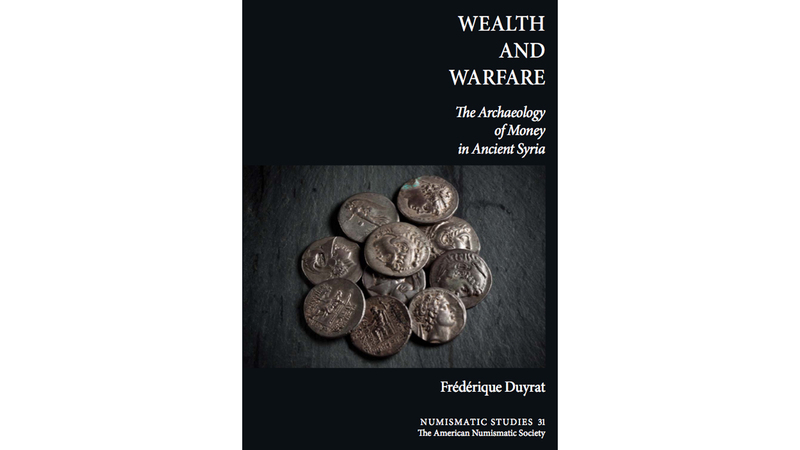 The American Numismatic Society is proud to announce the publication of Wealth and Warfare: The Archaeology of Money in Ancient Syria, by Frédérique Duyrat. Syria has been the theater of one of the most barbarous wars of the last centuries, characterized by war crimes and persecution of civilians. Beyond the human aspect of this conflict, one of the distinctive features of the war in Syria has been the treatment of cultural heritage. It takes two different forms. The most obvious is the systematic destruction of historical artifacts and remains by ISIS, dubbed “ cultural cleansing” by UNESCO’s Director-General Irina Bokova. There is a second aspect to the “ cultural strategy” of ISIS. This group is completely different from all the preceding forms of international terrorist organizations since it is only marginally dependent on foreign funding and has accumulated an impressive war chest. The traffic of antiquities has, among other activities, become an essential resource for the group. The income represented by looting and illegal traffic of antiquities has been estimated at around $200 million per year, and may represent the second largest source of income for ISIS. Moreover, the chaos caused by this multiparty war is beneficial to different groups of looters, whatever the cause they defend. In such a context, the role of the historian of antiquity is particularly crucial: to gather all that can allow us to reconstitute this endangered past, to interpret the artifacts, to make them available for future generations in a future time of peace when people will be able to rediscover their roots. But how can numismatics be involved in such an important mission? Coins are tiny, scattered, and they require highly specialized skills to be interpreted. Even studied with care, they remain difficult to understand as a whole. One of the reasons why coins are such a difficult source is their number: issued in the millions, lost or hoarded in the tens of thousands, they form an ocean in which the non-specialist feels lost. To study the coinages of an entire region is a way to approach coins as a single source. Moreover, to study ancient Syria through this particular source sheds light on new aspects of the past of a region currently devastated by war. This is what author Frédérique Duyrat has done in Wealth and Warfare: The Archaeology of Money in Ancient Syria. Frédérique Duyrat is director of the Department of Coins, Medals, and Antiques of the Bibliothèque nationale de France and is associated to the research team Orient et Méditerranée—Mondes sémitiques (University Paris–Sorbonne) and the Ecole doctorale Archéologie of the University Paris I–Panthéon Sorbonne. She has written and edited more than 50 books and articles on the coinage, history and archaeology of ancient Syria and Phoenicia. Wealth and Warfare is available for purchase through the ANS’s book distribution partner Casemate Academic/Oxbow Books at (http://www.oxbowbooks.com/dbbc/wealth-and-warfare.html). Members of the American Numismatic Society qualify for a member discount of 30% and should write to Andrew Reinhard, ANS Director of Publications, at areinhard@numismatics.org for the online discount code.